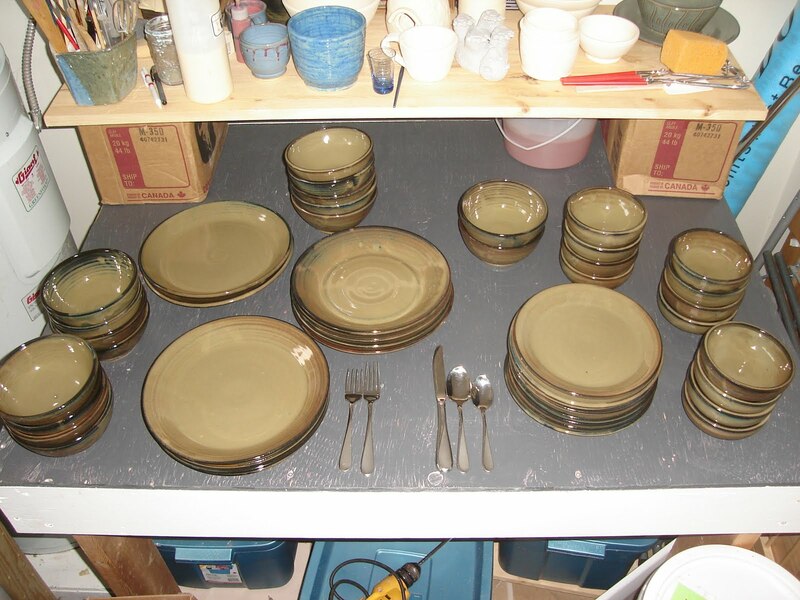 Photo is approximately half of a dinner set for a wonderful family that was well received and took 6 months to finish, with a few spares just in case. The trip to Pencticton for Ironman and Calgary, was highlighted for me by going to the Highland Games in Canmore with my sister who was there volounteering to flip pancakes at 5am. We went much later in the day and walked through to see the groups of pipers interact and march together which was truly amazing, the 5 groups of pipers followed one leader and looked seamless. Behind us was a little line of tents set up with all sorts of items that fit in with the celebrations like kilt stores and special cookies. My family simultaneously pointed out a potter who had a display of lovely dark pots with cut away sections that made Celtic knots out of the negative spaces! They were amazing. The potter had one eye fixed on me once I picked up the first pot, they were REALLY light and well thrown and balanced, she had been doing this for a long time!! I asked her about how long she had been potting and it turned out 40 years would about cover it. She was warm and friendly and we instantly started to chat and compare notes, she had worked an outside job for the first twenty five years or so before her husband quit to stay home with the kids so she could go 'pro'. She was everything that I had found in the first few potters I had met up in Bonnyville, Alberta back in 1996, warm and full of fun stories about pots and life 'building our own boxes' instead of thinking inside them. My family was over watching the event and Dave turned to check on me just as I was saying goodbye with a long, firm hug which he must have found surprising as he looked puzzled... didn't I just meet this woman?? It was such a warm meeting and welcome from another potter who would actually understand what my days are comprised of. I told her that I attend the weekly Market and she was appalled by the amount of work that packing and hauling and setting up and taking down and laughed out loud when I told her that I haul everything on a bike trailer, very well packed of course!! She told me all about the country-side tour group that she was part of that encouraged all those city folk in Edmonton to get out and see what the countryside had to offer. She offered to help out with starting an art tour of my area and I smiled thinking of all the tours we have here for food, wine, art and culture. If you want to meet her too click on http://www.potterybyheather.com/ and visit her studio next time you are in Alberta. I have arrived back at the studio to find that I have no where near the pottery I need to have to be ready for the fall season and the generous display case at the Clements Center is going to be used for a community living display soon so I need to take the display down today. I have to change out the mugs at Coffee on the Moon and Black Coffee at Whippletree Junction and then get to work for the next 6 weeks. I also have to decide whether I should rent the Centre for just Saturday as I have done the last 4 years or rent it for both Sat and Sunday, I also need to decide whether it would be a good idea to invite another artist to join me in the show, who would I invite and what would I charge them. I have an interview of sorts at the Chemainus Theatre Gallery and Gift Shop to see if they would like to have my pottery in there on Wednesday at 1030 and have to have a plan for the presentation. I also need to make up the pamphlets to hand out so that people will attend my show, I need new business cards from a new printer, and I need to harvest a few hundred pounds of fruit and veggies from all over to fill the freezer so we can eat all winter. It looks like the next blog update will just have a photo of a blurr or activity or maybe a photo of me sleeping on the floor of the studio (or maybe of sleeping in my own bed on a drop cloth covered in clay bits taken by an always supportive husband laughing as he gets home from work late). I will send some updates soon and thank you for reading me. Sorry, I commented on the wrong post..
We will talk soon too! but that set is amazing!! !